Hello this fine spring morning. Stewart is our featured piglet today. Many of you rushed to help the Sadd family's vet bill. Several checks came in after we had the bill paid and were put them on account for the next event. Stewart was that next event. 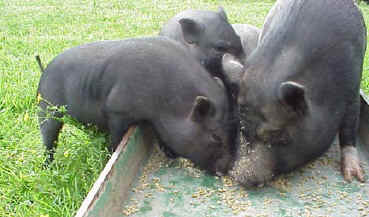 Stewart (photo-left), his sisters Syvie (photo-center) and Sox and his brother Sutter, are the children of Dumpling (photo-right), a tiny young girl that was rescued from a Georgia animal shelter by a Pig Rescue there. (Ahh the networking...it works so well). When Leigh had the boys neutered Stewart was found to be a cryptorchid. So we decided to send the whole family up here so they could be together while homes were sought for them and Stewart could have his surgery in Knoxville where we had the credit at the vet. The surgery was successful and once recovered he was brought back to be with his Mom and family. We are currently checking out a home for Stewart and he and another baby may be placed soon in a family home on a big farm where they will get to enjoy many happy years. Don't we love those happy endings!! Thanks to all of you who helped with the Sadds' bill and ultimately with Stewart's. And to all of you who support the ongoing work of our sanctuary and all of the others who work untiringly to help save these unfortunate little immigrants. It's why we have those happy endings! Here is Stewart and his Mom & Sister Sylvie. Stewart is on the left..."Mom, quit hogging the food!"